A few weeks ago, we were trying to figure out what to make for dinner and Rory said he wanted something with peas and pancetta. The only thing I thought of was carbonara, but dang, so much fatness to it. So I went to Pinterest to find something and I found the perfect Spring pasta dish. Plus the directions and measurements are vague in that you can improvise to suit your own needs. Perfect for us. 1. Cook your pasta according to the directions on the box. 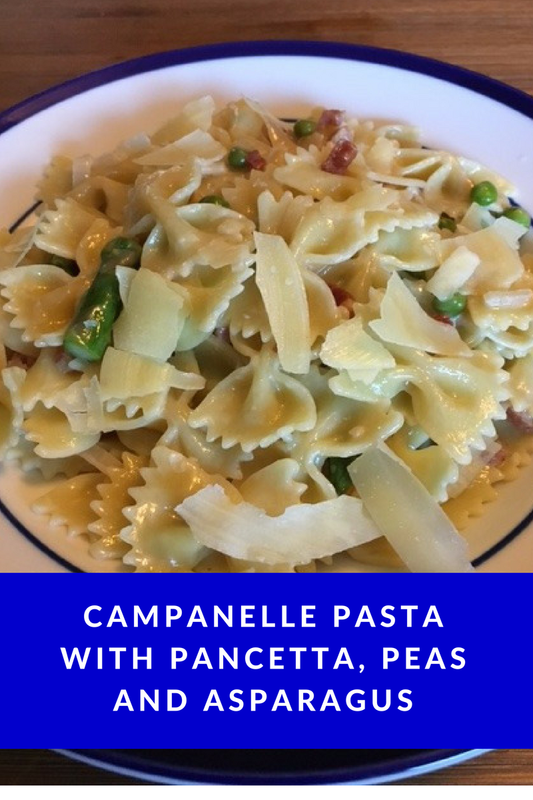 For the first time I made this, I used campanelle pasta and we LOVED it. This time I used farfalle since my store was running an amazing special on pasta. If you can find campanelle, use it. 2. When you have 2 minutes left until your pasta is done, add in your asparagus pieces and let them cook. Drain the pasta and asparagus together. Set aside. 3. 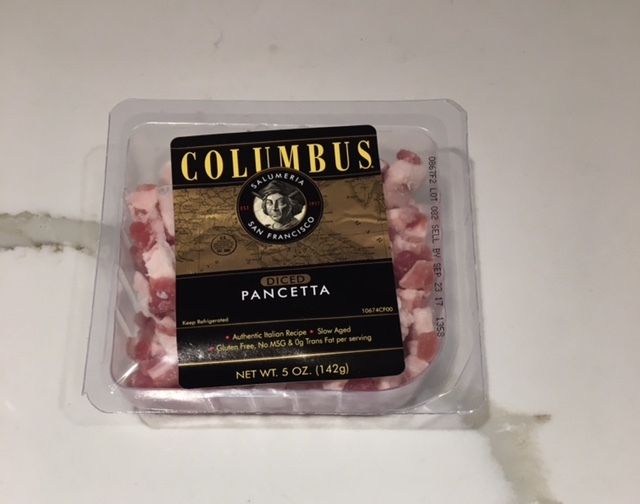 In a large skillet, cook your pancetta on medium heat until your pancetta browns. About 3 to 5 minutes. Tip: Find the pre-chopped pancetta so you get the chunks of pancetta rather than small slices. 4. Push your pancetta to the side of the pan and add in the shallots right into the leftover oil. Cook for 1 to 2 minutes. 5. Add in your garlic and cook for 30 seconds. Do not let your garlic burn. 6. Add in your white wine and turn the heat up just a bit (about medium-high or slightly lower) and let the wine reduce for 3 to 4 minutes. 7. Add in your chicken stock and peas and cook for another 3 to 5 minutes. 8. Turn your heat down to medium low and add in your heavy cream. Cook for a couple of minutes. 9. Add in the drained pasta and asparagus. Toss and add parmesan cheese to the top. Making use out of the leftover wine! The best thing about this pasta is you can change up the ingredients. Add in sun dried tomatoes instead of asparagus, or add in squash, zucchini, English peas, etc. I love how versatile it is. Plus it felt light and tasted so good. This looks Delish! Saving this recipe! YUM!! I have never cooked with pancetta but it looks so good! I need to learn how to cook good asparagus. I'm not really good with it. This looks and sounds amazing!!! I love simple recipes like this. Yum! This is good inspiration to change it up for sure, especially since I am not a pea person really. I am thinking artichokes and sun dried tomatoes, mmmm! This sounds so good! Pasta is the one thing that we can always get the kids to eat. I will definitely be trying this! That is the same way in our house! I hope you love it. This is great because Pasta is one of the things Ben can eat (when we use the gluten-free noodles). I'm always looking for variations of pasta dishes. Yum!! This looks delicious! It's very similar to one I make in the crockpot using peas and chicken. It's so good! Pasta is my favorite - this looks so good and seems like such a light option - as you said, perfect for spring! This sounds DELICIOUS!! So springy and good. I'm addicted to pretty much all pasta, so I love this one that seems a little lighter for this time of year. Me too. I love pasta way too much so a lighter version helps. My kids would love this (hello HEAVY CREAM!)! And mama loves how easy it is! 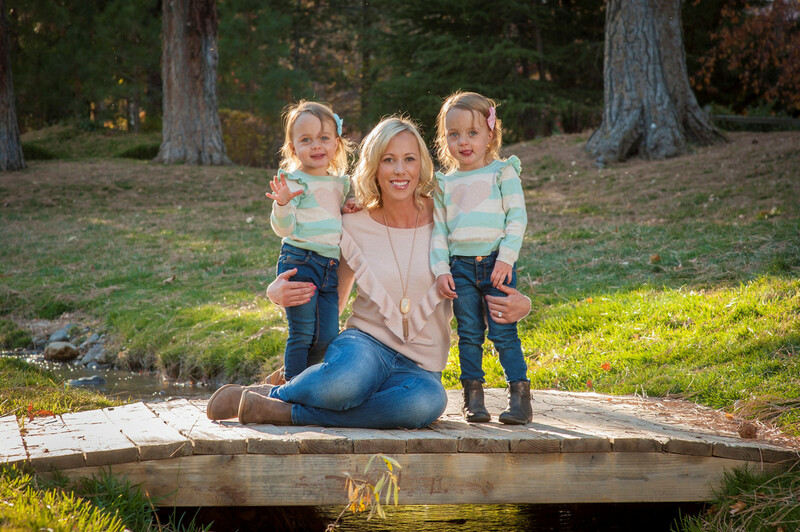 Forgot to say: Thanks for linking up at The Blended Blog! It's dangerous to read this right before lunch, especially since I love pasta! Haha. I would have to agree!